Fourteen states raised minimum wage on New Year's Day this year, and three more will do so later in the year, but Oregon's minimum wage will not budge in 2016. Oregon lawmakers failed to agree on a minimum wage increase in 2015, with rural and urban politicians disagreeing to a one-size-fits-all number for the state. One native Bendite battling to make ends meet is Aaron Cooper. A few weeks ago, the 25-year-old was offered a full-time job as a dishwasher at Central Oregon Community College (COCC). So far, he's enjoying his job and says the work environment is great. When Cooper's shift ends, he goes to his car—where he's been sleeping for the last eight months. Earlier this month, Gov. Brown unveiled proposed legislation to raise the minimum wage gradually over the next six years, but the increase also depends on geography. For people living in the Portland Metro Urban Growth area, minimum wage would increase to $15.52 per hour by 2022. The rest of Oregon would see a slower crawl from the current $9.25 per hour to $10.25 in 2017, ultimately reaching $13.50, six years from now in 2022. The federal minimum wage has been $7.25 per hour since July of 2009. Though Oregon's minimum wage is two dollars per hour higher than the federal minimum wage, neither the state nor federal wage nears the equivalent of a living wage. According to the Massachusetts Institute of Technology, a living wage for two adults (one working) and two children in Bend is $23.65 per hour. MIT's Living Wage study defines a living wage as "an approximate income needed to meet a family's basic needs." Last week, the United Way's ALICE Report brought to light the financial struggle for workers who are categorized as Assets Limited, Income Constrained, Employed. Oregon's population of 3.9 million makes up 1.5 million households. The United Way study of financial hardship combined the number of people living in poverty and the number of ALICE workers for all Oregon counties. In Deschutes County, 41 percent of the population does not earn enough income to afford basic needs such as childcare, housing, food and transportation and statewide the total is 38 percent of all households. Many minimum wage and low-wage workers rely on government subsidies to assist with basic necessities—a tab picked up by taxpayers. According to the Oregon Workforce Report published by the University of Oregon Labor Education and Research Center, the annual cost of public assistance to workers in Oregon is over $1.75 billion. Nationally, according to research at UC Berkeley, more than half—56 percent—of combined state and federal spending on public assistance goes to working families. Raahi Reddy, with University of Oregon's Labor and Education Research Center, says the general framework of the report shows that wages in Oregon stagnated from 2002-2012 even though productivity in Oregon increased. "What we saw in Oregon, which was very much reflected in the rest of the country, was that profits and wealth going to the top one percent were increasing;" however, "those benefits from that wealth were not trickling down to workers and were not actually increasing wages," she said. Cooper earns $10.25 per hour at COCC, and recently found a second part-time job on the weekends. His struggle to find housing on a low wage is not uncommon. "Everybody is looking for first and last [month's rent], and doing a minimum wage job, its going to take you a while to come up with that," he said. Over the past six months, Cooper found jobs through a staffing agency but the work wasn't steady so he went to the Oregon Department of Human Services office to apply for SNAP benefits (food assistance). 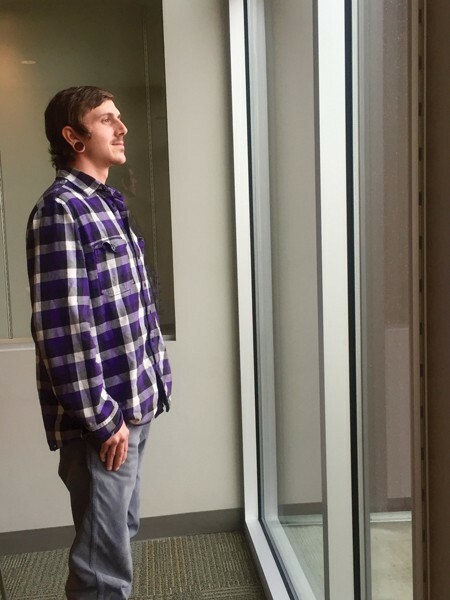 When Cooper told a DHS employee that he was homeless, he was told he didn't look homeless. He asked, "What does homelessness look like?" Cooper said he would like more people to be aware of the many low-wage workers in Oregon who are one paycheck away from being homeless. Looking back, Cooper never realized how close his family was to being homeless until he was older. "We were that close from just having everything gone all the time—every month, every week," he said. "People shouldn't live like that or shouldn't have the feeling that can happen, especially with two or three jobs being held down and that still being a possibility." The State of Oregon Employment Department in 2015 noted a sharp year-over-year increase in the number of workers holding two or more jobs. Cooper is hopeful he'll be able to get by on his two jobs. For now, despite the harsh Central Oregon winter, he said blankets and sleeping bags keep him warm in his car.